I don't have any new makeup items or looks to share, but it's been awhile since we've had a makeup thread, and I didn't want to let my lack of makeup nooz delay the fun for everyone else, lol. 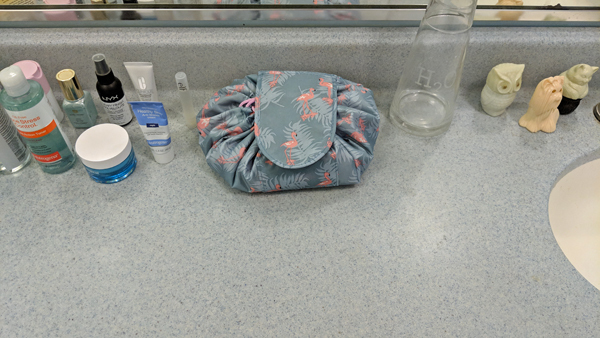 So I will just again mention the drawstring cosmetic bag that I recommended in a February Shaker Thumbs thread, for anyone who might have missed it. It works very simply: When you open it, it spreads out and allows you to view all your makeup at once. 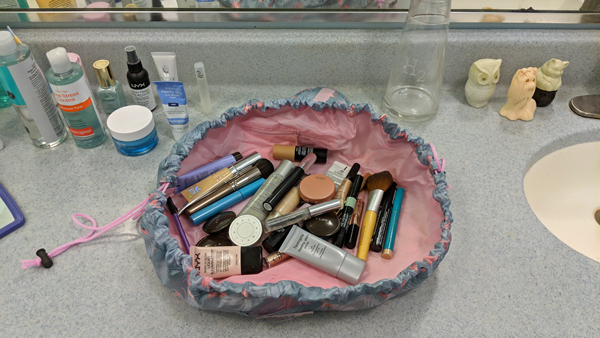 I keep all the things I use frequently in here, and then the stuff I use much more occasionally is stored neatly in a closed box in the corner of the vanity. I could fit a lot more in here, but these are my go-to products. And then when you're done, you just pull the drawstrings to close it, tuck in the drawstrings, and fold it closed. It literally takes seconds. And then I've got a nice, clear, clutter-free bathroom countertop! I have tried many things over the years to organize my makeup in a way that I liked, and this $10 thingy is the absolute best. Nothing else has even come close! I get to see everything I need at a glance, and then I get to put it all away neatly in a moment. Just yesterday, I was thinking how I might order a second one just to keep in storage in case this one ever wears out and they aren't being sold anymore. That's how much I love this thing, lol!